When you start and end your transaction on eBay Motors, you automatically get the benefit of eBay’s Vehicle Protection Program*. With more than 5 million cars sold to date, eBay Motors offers protections you won't find anywhere else online, such as up to $50,000 in Vehicle Purchase Protection and free vehicle history report. *Restrictions apply. See terms and conditions. Emails are not sent from the 'eBay.com’ domain. Criminals may have a recognizable word in their email name or as part of their domain name, such as 'eBay' or 'VPP' (e.g., eBay@vppinsurance.com) but these are NOT sent from eBay. The FBI today is warning the public that online vehicle shoppers are being victimized by fraudulent vehicle sales and false claims of vehicle protection programs (VPP). In fraudulent vehicle sales, criminals attempt to sell vehicles they do not own. They create an attractive deal by advertising vehicles for sale at prices below book value. Often the sellers purport they need to sell the vehicle because they are moving for work, to include military deployments. Because of the alleged pending move, criminals refuse to meet the victim in person or allow a vehicle inspection, and they often attempt to rush the sale. To make the deal appear legitimate, the criminal instructs the victim to send full or partial payment to a third-party agent via a wire transfer payment service and to fax the payment receipt to the seller as proof of payment. The criminal pockets the payment but does not deliver the vehicle. Criminals also attempt to make their scams appear valid by misusing the names of reputable companies and programs. These criminals have no association with these companies, and their schemes give buyers instructions that do not adhere to the rules and restrictions of any legitimate program. For example, eBay Motors' VPP is a legitimate program whose name is commonly misused by these criminals. The VPP is not applicable to transactions that originate outside of eBay Motors, and it prohibits wire-transfer payments. Nevertheless, criminals often promise eBay Motors VPP coverage for non-eBay Motors purchases and instruct victims to pay via Western Union or MoneyGram. In a new twist, criminals use a live-chat feature in e-mail correspondence and electronic invoices. As live-chat assistants, the criminals answer victims' questions and assure them the deals are safe, claiming that safeguards are in place to reimburse buyers for any loss. The criminals falsely assert that their sales are protected by liability insurance coverage up to $50,000. 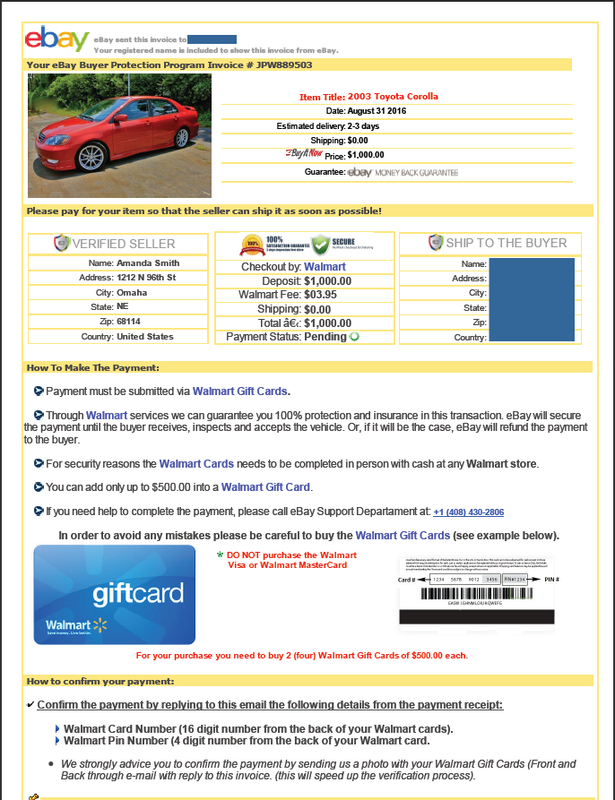 If you have witnessed this behavior or fallen victim to this type of scam, please file a complaint with the FBI's Internet Crime Complaint Center, www.ic3.gov. Research and inspect the car. Go beyond the information in the vehicle listing. Take advantage of vehicle history reports to be certain of mileage and vehicle condition. Review the title and hire an inspection service to look at the car prior to purchase. Check the person's background. Examine the seller's feedback, ratings and comments. Communicate directly with the seller by phone or through secure channels like the My eBay message center to ensure correspondence is authentic. Never send payments via wire services. Never use Western Union, MoneyGram or other wire services—bank to bank transfers are okay. If you plan to pay in cash, do so in person and obtain a receipt.